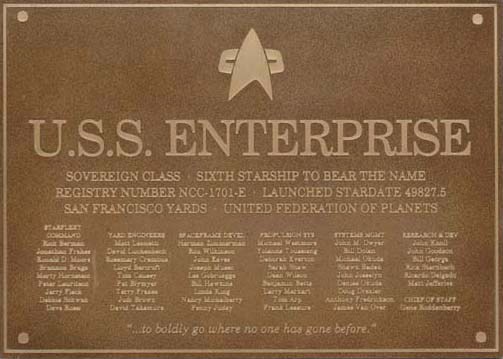 Here is an alphabetical listing of Starfleet and Federation ship names. The somewhat definite origins of the names (meaning the in-universe namesakes) are given in the column "namesake", uncertain references (sometimes in-jokes) under "annotations". 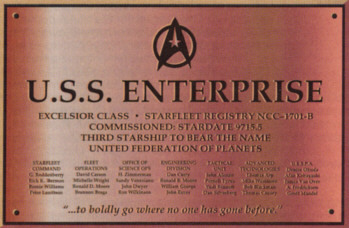 See also: Possible Namesakes of Federation Starships with many more suggestions but with a good deal of speculation. NCC-62497 Akira Unknown We may assume that, rather than remembering 20th century pop culture (namely the anime Akira), Starfleet has named the ship for someone of that name who has gained significance some time between today and the 24th century. Akira is Japanese for "bright(ness)", which would make a good ship name, even if not named for someone specific. NCC-501 Brightest star in the constellation of Scorpio, Greek for "Anti-Ares/Mars"
SS Aurora Roman goddess of the dawn It could be also short for aurora borealis, the northern light. 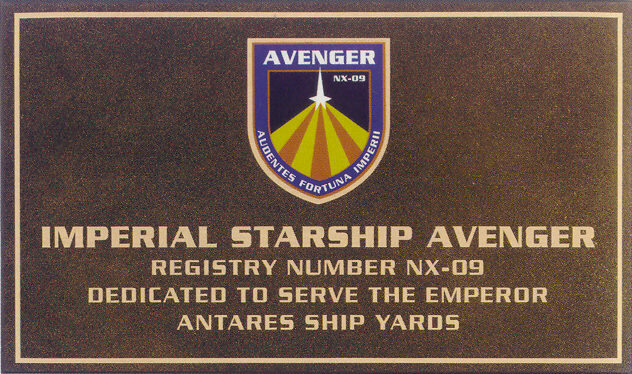 (Mirror Universe only) NX - The inscription on the Avenger plaque can be translated as "The bold (are) the fortune of the Empire". NCC-62048 Nebula Hero in ancient Greek mythology, tamed the Pegasus and defeated the Chimera It is also a homage to the movie "Forbidden Planet" where the missing ship was named Bellerophon. NCC-1941 Soyuz City in Montana, USA, launch site of Cochrane's Phoenix The registry NCC-1941 is a (quite fitting) in-joke, as Greg Jein was working on the Movie "1941" in 1979. Montana is obviously a lot more illustrious in Star Trek than in the real world. Bozeman is Brannon Braga's home town. 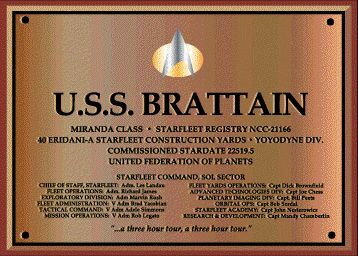 NCC-21166 Miranda Walter Brattain (1902-1987), American engineer, developed the first bipolar transistor together with Shockley and Bardeen, Nobel Prize 1956 I assume that the ship was incorrectly labeled as "Brittain" and that the dedication plaque is correct. At least, this was the original intention. See here. C-57-D Uncertain This is a homage to the groundbreaking science fiction movie "Forbidden Planet", just as the name of the ship's captain on the display in DS9: "Whispers", J.J. Adams. NCC-42136 Excelsior Capital of Egypt If it was meant as a homage to Egypt, it was counterproductive to use the English name. NCC-71099 Galaxy The registry of the Galaxy-class ship, although not quite fitting, is obviously a homage to the space shuttle. 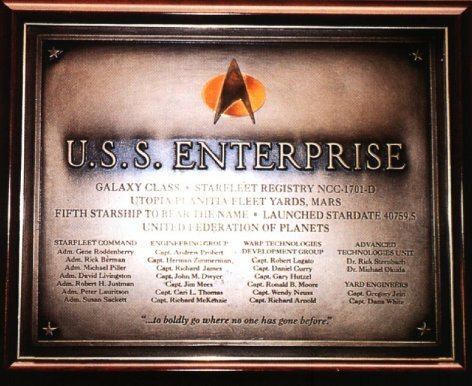 USS Clavyn Unknown Malone, Peterson and Clavyn (Clavin), the three ship names listed in Lt. Anaanda Ziff's personnel file, are all characters from "Cheers". 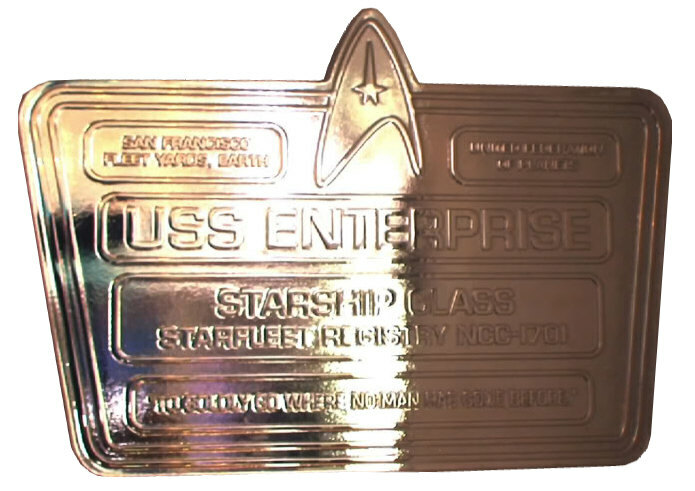 USS Clayton Unknown "Clavyn" was changed to "Clayton" in the remastered episode. NCC-12537 Apollo HMS Clement, Royal Navy submarine of the 21st century Creating retroactive continuity in the Star Trek Universe, the sunk HMS Clement (ENT: "Minefield") is a perfect namesake. SS Columbia Columbia OV-102, NASA space shuttle, broke apart during re-entry in 2003 Although the first ship named "Columbia" was mentioned long before the real-world Columbia disaster, it is a fitting assumption that Starfleet would still remember the shuttle and its crew (Memorial). 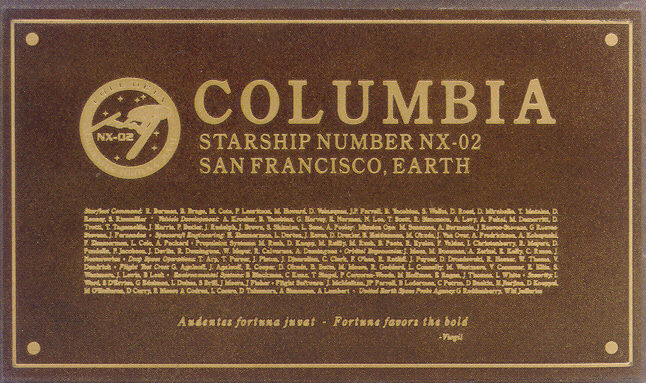 Giving the name to NX-02 is an obvious reverence. NCC-68711 Freedom Uncertain Possibly named for the French/British supersonic airplane. The name is often spelt "Concord" like Concord, New Hampshire and Concord, Massachusetts, a battle site of the American Revolution. But out of European solidarity, I assume that "Concorde" is correct. NCC-623 Oberth Nikolaus Kopernikus (1473-1543), German/Polish astronomer who discovered the true nature of planetary movements German and Polish historians both claim Kopernikus for their countries. The truth is blurry, as he comes from a German family but lived in a region belonging to Poland most of the time. USS Cortéz Hernán Cortéz (1485-1547), Spanish conquistador who gained Mexico for Spain Not really a wise name choice, considering how mercilessly his army subdued or killed the native Mexicans. NCC-42254 Unknown The ship was named for Dan Curry, DS9 VFX supervisor. Unless he is starting a great political career, Starfleet probably wouldn't remember him despite all his merits. USS Danube Danube River in Southeast Europe It would have been wiser to use an indigenous name of the river (Donau or Dunav or Dunava). 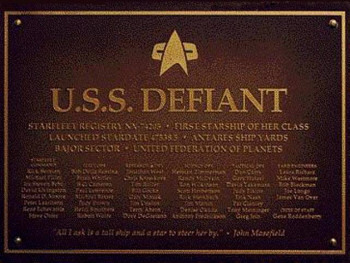 NCC-1764 Constitution - The only renowned ship of that name is the HMS Defiant in the movie of the same name (1962). SS Deirdre Uncertain May refer to an ancient Irish heroine. In real life, named for James Doohan's daughter Deirdre. The spelling should have been "Deirdre" but became "Dierdre" in the final script. Since this is an obvious (and common) error, EAS lists the ship as "Deirdre". USS Destiny - In the real world, the ship was probably named for the Destiny science lab of the ISS, but this may be regarded too obscure a reference in the 24th century. 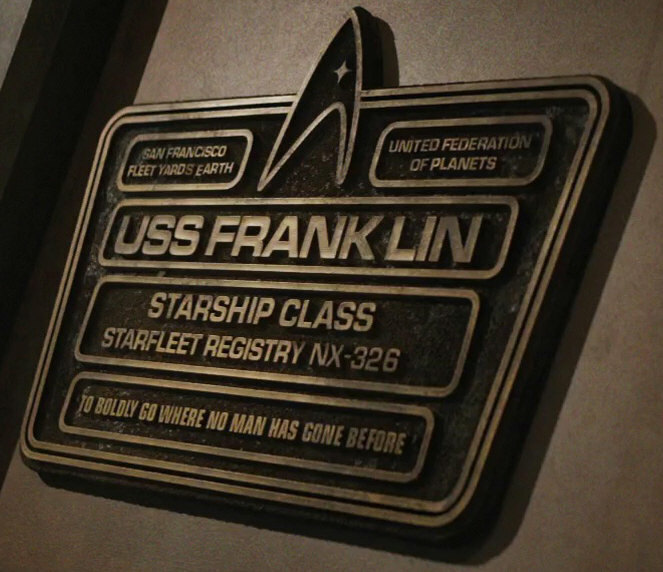 NCC-956 Constitution - Although it's quite a common name, most likely the Starfleet ship is specifically named for the landing vehicle of Apollo 11. NCC-74121 Unknown The ship was named for Judy Elkins, DS9 VFX supervisor. Unless she is starting a great political career, Starfleet probably wouldn't remember her despite all her merits. NCC-85343 Unknown No, Elmer Fudd really isn't a good namesake for a ship. NCC-2120 - The name may specifically refer to the Entente Cordiale, an alliance between Great Britain and France in 1904. NCC-1701 (alt.) Parallel universe ships, with presumably the same name history up to this point. NCC-1988 Unknown In real life, the name refers to the Equicon Convention that took place in 1988. 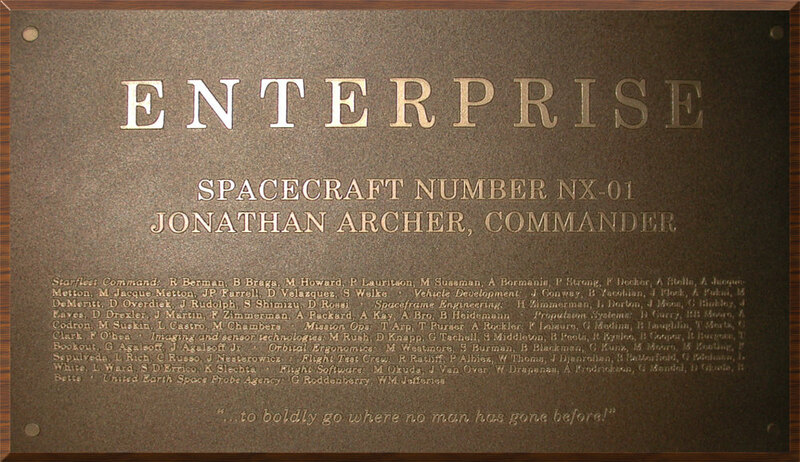 NCC-72381 Nova Latin equinoctium, the equal length of day and night twice a year According to Mike Okuda, the ship’s dedication plaque bears a quote from Sir Thomas Browne, “The night of time far surpasseth the day". SS Erewhon Uncertain Read the name backward! Erewhon is a novel written by Samuel Butle. 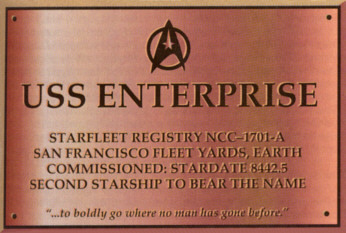 NCC-1672 Constitution Several Royal Navy ships and/or the English city. There may be no particular namesake. NCC-31823 Uncertain In real life, Farouk El-Baz is an Egyptian American scientist who selected the landing sites for the Apollo missions. In the fictional universe, Farouk El-Baz is a noted comedian (TNG: "The Outrageous Okona"), but we wouldn't expect starships to be named for comedians, would we? 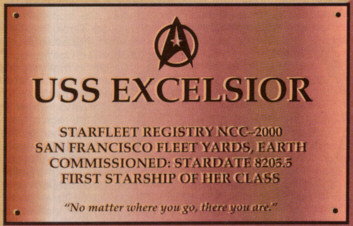 NCC-42111 Excelsior Unknown The ship was named for Anthony Frederickson, scenic artist. Unless he is starting a great political career, Starfleet probably wouldn't remember him despite all his merits. USS Freedom Freedom - In 1990, when BoBW was made, the name may have been supposed to honor the space station that was later simply called ISS. NCC-9761 Constellation Admiral Gihlan’t’aehn, who initiated the development of the Constellation class The ship name is from an article by Rick Sternbach in Star Trek: The Magazine. SS Hatteras Uncertain There is a novel character Captain Hatteras by Jules Verne, but the real Cape Hatteras in North Carolina seems to be a better suited namesake. NCC-42 - A very obvious reference to The Hitchhiker's Guide to the Galaxy. 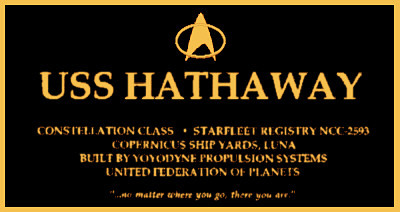 USS Hokule'a Hokule'a Hawaiian word for "Star of Gladness"
NCC-10532 Ambassador Uncertain Horatio was the first name of real-world Admiral Nelson as well as of Admiral Hornblower in the novels by C. S. Forester. But since when are first names used as ship names? Horatio is also a character in Shakespeare's Hamlet. NCC-176 Daedalus - It remains to be seen whether the Mayweathers' ship could be the namesake. NCC-4077 James Fenimore Cooper (1789-1851), American writer The captain's name and the registry are references to M*A*S*H. The name is misspelled "Fennimore" on the actual display, but according to EAS policy the misspelling is ignored. NCC-0514 William Thomson, 1st Baron Kelvin (1824-1907), Irish physicist In an interview about the ship, Roberto Orci and Alex Kurtzman said that Kelvin is JJ Abrams's grandfather's name that he includes in every series and movie he creates. The odd registry is grandpa's birthday. SS Kobayashi Maru Uncertain Kobayashi is a last name. Maru is a suffix appended to many Japanese ship names and also swords. SS Kogin Unknown The ship's name can be read in TNG-R: "Inheritance". It was likely different in the original episode.